We supply, undertake commissioning and test Diesel Generators from 10 to 3300kVA with full stations, synchronizing system & load management with complete Fuel tank system; sound proof rooms with the best handling of exhaust piping using Silicate. Epoxy painting on the iron pipes using the matching colors of the building enhances its aesthetic value. Generators should always be installed, serviced and repaired by the authorized and certified technicians who have a thorough knowledge and they should always comply with standard operating procedures while doing so. While determining a suitable location for your generator set there are many aspects you have to take into consideration. Access, space for maintenance, noise, ventilation, exhaust piping, fuel piping, humidity, and temperature are some of the factors that must be considered. A location where temperature conditions are controlled and noise isolation from main working area is preferred. A tail water gallery location is frequently used for a generator set. The generator should be placed on a level surface, which is non-combustible and non-conducting and a little above the ground level to prevent its contact from rising water levels. To connect a standby generator to your existing electrical system, you’ll need a separate device called an Automatic Transfer Switch. The transfer switch is an essential safety system that prevents your generator from feeding electricity back to the local power grid. Do not attempt to install a transfer switch yourself. Installation of transfer switches always requires a professional electrician. The model of transfer switch will depend mainly on the size of your generator. In very high-priority situations such as hospitals, higher-end transfer switches can be worth the extra cost. 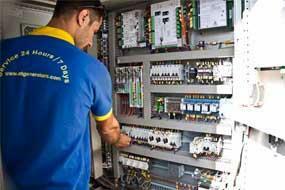 In addition to the generator and transfer switch, you may want to invest on a dedicated electrical sub-panel, as well. Only your essential equipment is connected to the sub-panel, which is connected to the generator. That way, when power fails, your critical devices will get the emergency power without the risk of overworking your generator or turning off or unplugging other equipment. Extreme care should be taken when designing and installing the fuel system. Fuel lines should have few connections as far as possible and it should be kept away from hot engine or exhaust components. The fuel tanks should be in a level with or below the set to prevent siphoning in the event of a line failure. If the set is higher level than the tank, an auxiliary fuel pump may be required. We are self sufficient to test all our generators supplied with the best capability. I.e. we have Resistive / Reactive Load Banks facility. A.T. GENERATORS is making the commissioning and installation of all Gen-set sizes with the utmost care in detail, using the well trained technical teams and according to high level standard. Also by using the modern instruments, we shorten the time of installation and thereby achieving high productivity. We also undertake turn-key projects by providing all the necessary material and accessories needed to finish that particular project.